Microtubules are the “railroad tracks” essential for moving intracellular “freight” around in the cell. They’re also part of the spindle that pulls the two centrosomes apart during cell division. Now researchers at Vanderbilt University Medical Center have made a fundamental advance in understanding how microtubules are assembled. Their finding, published as an Editor’s Pick last month in the Journal of Biological Chemistry, may lead to new ways to control cancer, which is abnormal cell growth. In 1999, Goldenring and colleagues published the sequence of a large scaffolding protein, AKAP350, which appeared to play a role in assembly or nucleation of the microtubules by centrosomes, the cell’s two barrel-shaped microtubule organizing centers. 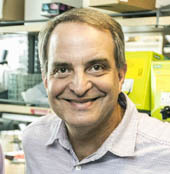 In the current study, led by Elena Kolobova, PhD, research instructor in Surgery at Vanderbilt University School of Medicine, the researchers used high-resolution microscopy to identify the protein’s specific location spanning a bridge between the two centrosome “barrels,” and its role in coordinating centrosome formation. The finding has relevance to cancer because paclitaxel (Taxol), a common anti-cancer drug, stops out-of-control cell division by stabilizing the microtubules. “The problem is you have microtubules in every cell,” said Goldenring, the Paul W. Sanger Professor of Experimental Surgery and professor of Cell and Developmental Biology. “You shouldn’t be surprised there is a laundry list of side effects,” he said, including neuropathy, bone marrow suppression and heart and lung problems. Other Vanderbilt faculty members who contributed to the study were Joseph Roland, PhD, and Lynne LaPierre, PhD. The research was supported in part by National Institutes of Health grant RO1 DK043405.